Before I headed out to Malapascua, I went on an Everglades tour with two of my friends. I’m a Floridian but have never spent any time in the Everglades so it was a fun adventure for me, and extra nice because I didn’t have far to go to get to the Everglades. Other than the alligators – of which there are MANY – the main attraction in the Everglades is the mangroves! What are mangroves, you may ask? They’re trees that live in brackish water and do a whole bunch of cool things for the environment. They’re vital in preserving coastal lands, because they help prevent erosion and mitigate storm damage. They also provide a breeding ground for fish, sharks, and other important marine life. And they’re super cool to look at, with their funky root systems. So, mangroves are cool. Malapascua has a few mangroves. 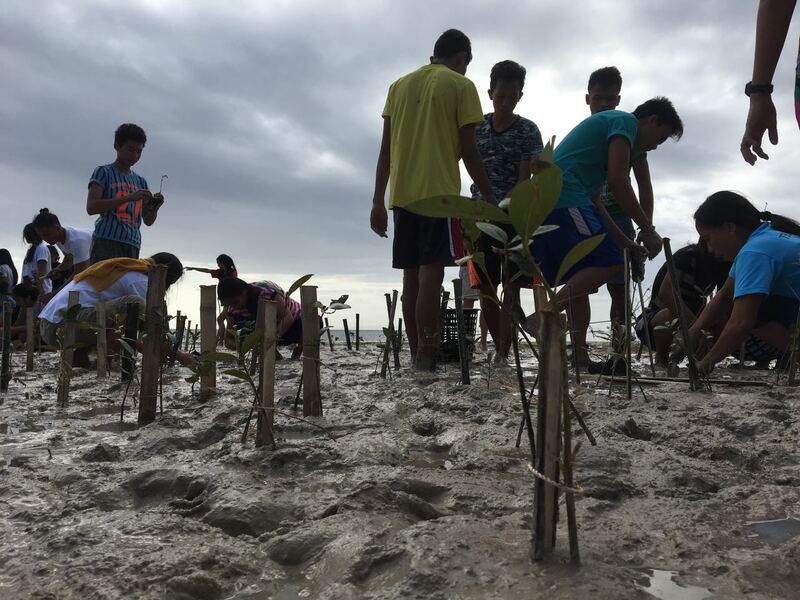 I’m not totally sure of the laws, but I’ve been told that highschoolers are required to plant a certain number of them in order to graduate, because mangroves are super important to the Philippines. After some research (by which I mean: a bunch of us tromped all over the island, asking the locals), we found out that one batch of the mangroves had been planted by the local highschoolers, and the other had been planted by…some other guy. The guy whose property backs up to the ocean where they’re planted. I’m not sure of his name. Anyway, Chief Scientific Officer Glyn has been on a bit of a jag about planting more mangroves, seeing as they’re so vital to the ecosystem. So he and Judith, the Local Coordinator for PepSea, took a boat to the local MENRO (Municipal and Environmental Natural Resources Organization. Phew, what a mouthful) and see if some more mangrove seedlings could be donated to PepSea. Aaaaaand: the MENRO agreed to donate 1000 seedlings! SUCCESS! So what did that mean for PepSea? First of all, it meant a lot of planning and silliness. Judith arranged for the seedlings to be brought over on the basura boat (yeah, the one that collects Malapascua’s garbage and takes it to Cebu for processing). Expedition Manager Dom and his dude Angelo went to Cebu to pick them up and arrived back to Malapascua with a whole boat full of mangroves in tiny little bags, which had to be hauled from the boat across the low tide shores to the PepSea office. Once we had the seedlings on site, we had to acclimate them to the salt water / fresh water mix, plus the tidal changes. So Glyn, Angelo and I spent countless (ok – it was like 8) mornings hauling boxes of seedlings down to the shore to acclimate all day, and an equally number of evenings hauling the boxes back to the office and out of the way of potential thieves / curious children / errant waves that might sweep them away. Did I mention that mangrove seedlings (packed into containers, loaded up with sand and waterlogged) are quite heavy? One week of hauling was the best arm workout I’ve done all year. One week later after the mangroves arrived in Malapascua, we dropped them off by boat in their soon-to-be-home, for a little R & R overnight. 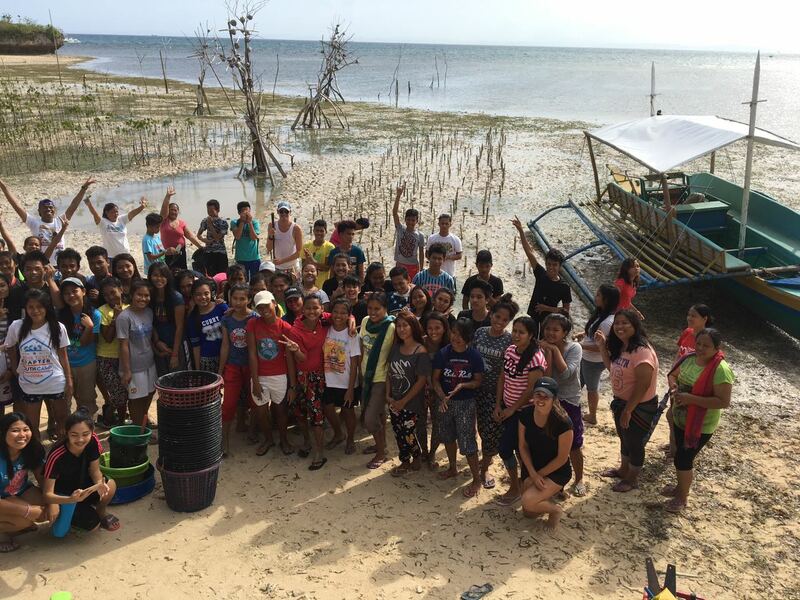 The next day, nearly 100 teens from the local school showed up to help us plant them in the low tide mud. It was a bit crazy but in less than 2 hours, those kiddos had planted 1000 mangrove seedlings. It was great fun! But the project isn’t over yet. Not by a long shot. Chief Scientific Officer Glyn is into stats, so we’ll be taking lots of data every week: plant height, number of leaves (healthy, damaged, predated), number of leaf nodes and who knows what else. We will do a sample of 50 random plants per week and track it all, hoping the plants will grow up to be big strong mangroves. Here’s hoping!